The Boycott, Divestment and Sanctions (BDS) movement and the organizations that fund it represent one of the most insidious and dangerous threats facing Israel today. The BDS movement retails “Palestinian” victimhood propaganda, often manufactured at the expense of “Palestinian” civilians who are deliberately put in harm’s way by Hamas, in order to cast Israel as similar to the former apartheid state of South Africa or worse. These organizations, and now the state of Navarre in Spain, emulate the Nazis in calling for a boycott of Jewish businesses. The enemedia and many Western governments are obsessed with the nearly non-existent threat of neo-Nazism. 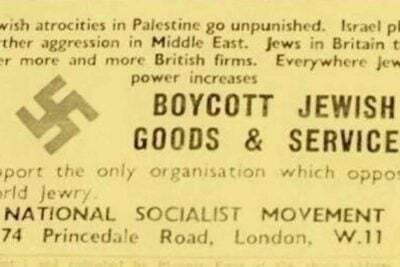 The BDS supporters are the real neo-Nazis. The motion went on to condemn Israel for “murdering” dozens of Palestinians in May. The condemnation is a reference to Hamas-organised riots along the border with Israel, which featured hundreds of firebombs and attempt to break the fence into Israel. Of 61 people killed in the riots on May 14, 50 were Hamas members, according to one senior member of that organisation…. The Navarre motion does mentions neither Hamas, violence along the border nor Israel’s right to defend itself. ACOM condemned it as discriminatory. In recent years, ACOM actions have led to the scrapping, annulment or suspension of 24 motions to boycott Israel by Spanish municipalities. Courts throughout the kingdom have declared such motions discriminatory and unconstitutional….